have a look at the painting process below & then i'll tell you all the story icons i hid in the background! once i watched EVERY episode available (though the matt smith years) and reading a few books along the way, i made sure to include story icons from all eleven doctors. 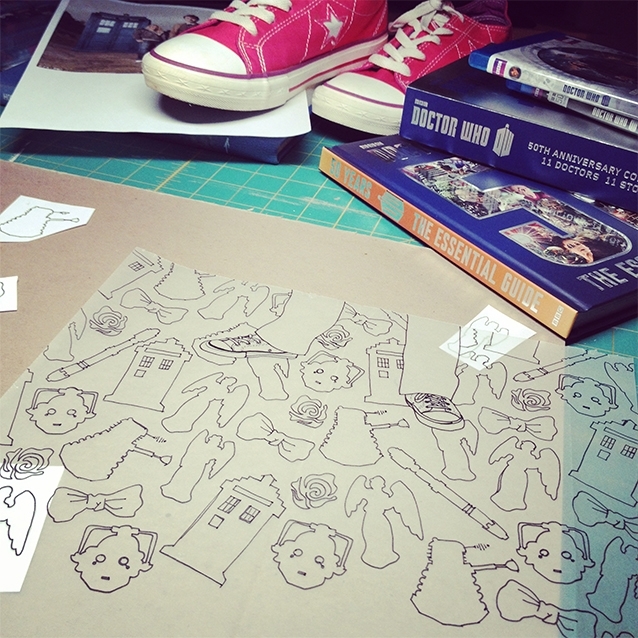 here i'm creating the background pattern with the story icons i tried to narrow it down to. 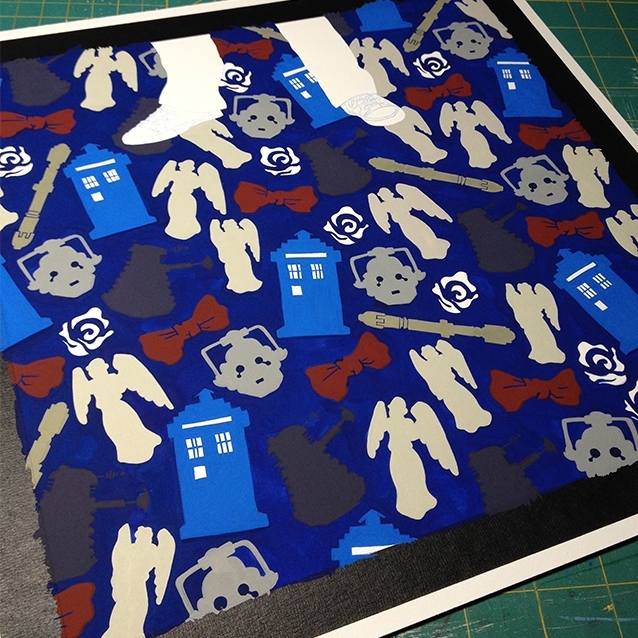 here’s the final background pattern drawing– with the (tenth) doctor’s feet. my right hand seen here painting in the blue background with beautiful gouache around each and every icon shape… this step has to be done in once sitting for our best chance of an even layer of gouache colour. it took about 6 (+?) hours. 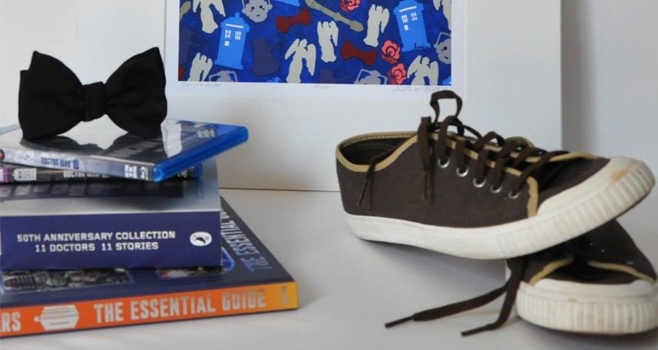 seen in the final painting, of course, are the tenth doctor’s sneakers and pinstripe pants. but background icons that cross many of the doctors’ incarnations and timelines make their appearances: bowties are cool, for example. as well as the weeping angels, the beauteous tardis, the cybermen, rose (not my personal fave companion; but probably just jealous over here), the daleks, the sonic screwdriver… you see. collect the limited edition print in my etsy shoppe HERE. 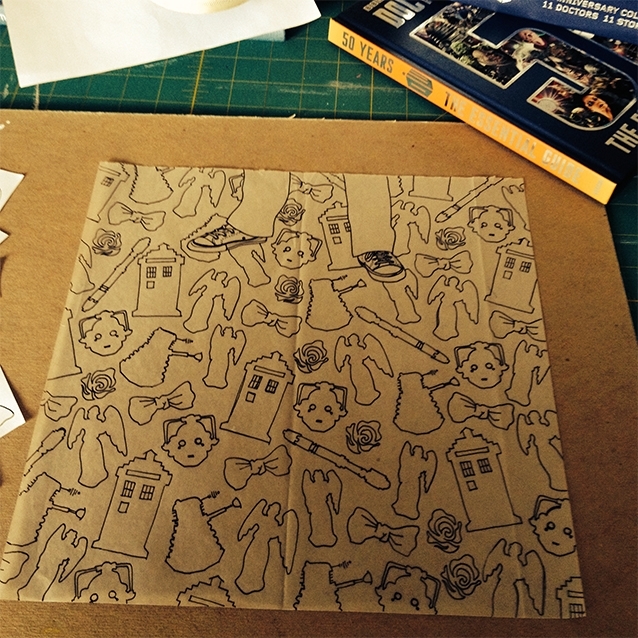 doctor who greeting card available HERE. from the very creepy werewolf/queen victoria episode. but yay books! the original painting is still currently available, framed, for $350 (+$40 for safe US shipping). contact me to inquire!